Jeffrey Khaner has developed a valuable video archive of online flute lessons. Students have unlimited access to the classical flute course which includes technique exercises, sheet music and orchestral excerpts. Learn to master the flute from a virtuoso. What ultimately sets these classical flute lessons apart from other offerings is the library of videos submitted by students using the ArtistWorks Video Exchange Learning® platform. Jeffrey reviewed each submission and recorded a video response, offering specific guidance to the student to take their flute playing to the next level. All students can access the Video Exchange library and watch these interactions with Jeffrey. This comprehensive archive, combined with a library of guided, high quality video lessons, may contain the key to unlock your playing. As Principal Flutist of The Philadelphia Orchestra for 20+ years, Jeffrey Khaner is one of the most respected names in classical flute. He has played with the Cleveland Orchestra, New York Mostly Mozart Festival and was selected by Sir Georg Solti to be Principal Flutist of the World Orchestra for Peace in 1995. 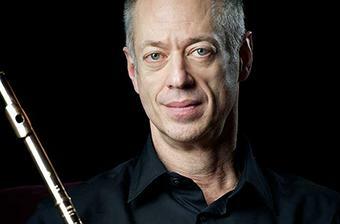 He is an accomplished soloist and works regularly with today’s top composers. A graduate of the Juilliard School, Jeffrey was later named to the faculty as flute professor and is also on the faculty of the Curtis Institute of Music and Lynn University’s Conservatory of Music. He has given master classes to students around the world and has been teaching with ArtistWorks since 2012.